Adepticon is fan-run convention that takes place annually in the Chicago area. It features national tournaments for Game's Workshops-Warhammer 40K, Warhammer Fantasy Battles and Lord of the Rings Strategy game and draws people from all over the United States and the UK. I attended its first day today, the highlight being the 132 player Warhammer 40k Gladiator tournament. 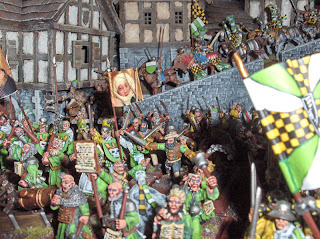 The army modeling, painting and display basing was quite impressive, however I actually thought the best looking stuff was in the fantasy department. This empire legion above was definitely the showpiece of the day, If it didn't win some kind of award at the end of weekend I'd be surprised. Below are two of the 40K armies I grabbed shots of that I really liked. Unfortunately by the time I got into photo mode, the tourney had already started and I couldn't get all the photo's I wanted. People weren't going to take kindly to my closeup flash hovering over there table while they were trying to play. 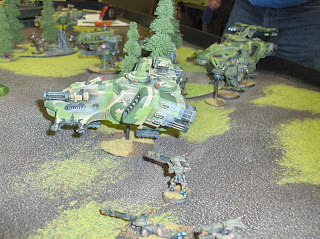 My favorite looking army had to be this camouflaged painted Tau force below. I haven't been that intrigued by the Tau before favoring the Space Marines and Chaos Space Marines, but seeing this guys stuff changed my mind. He took out his opponent quite readily in round 1 of the gladiator. 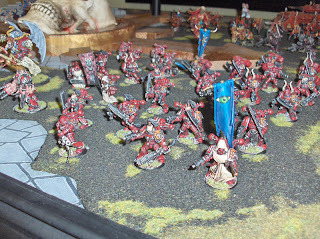 This photo below was a really good looking Chaos army. I met a couple of cool people who were all local Chicago players, and look forward to getting more involved in this next year. As a total spectator I had run out of gas after about 4 hours, and needing to resist the temptation to buy a Forge World ( expensive resin models imported from the UK) Drop Pod, headed home. Next up... some of my own older stuff including my progress on my current project- a 1000 point Space Marine army. Ultramarines 3rd Company, The scourge of Xenos!